Here you will find a listing of parks and park facilities within the Atlantic County Park System. Click on the title below to show more information about each park. The Atlantic County Park System maintains the 7.56 mile bike and pedestrian path running between Harbor Square (formerly Shore Mall) in Egg Harbor Township and the Atlantic County Institute of Technology in Hamilton Township. This tract of land was formerly a Girl Scout camp, but is now owned by Atlantic County and operated by the Atlantic County Division of Parks and Recreation. Located at 6755 Weymouth Road (Route 559) the camp is bordered by the Great Egg Harbor River to the east. 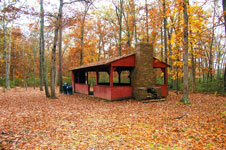 Camping facilities are reserved through the Lake Lenape Reservation Office at (609) 625-8219. This large tract was obtained to preserve the valuable role its streams play as a buffer protecting run off into the Great Egg Harbor River Watershed. Several major tributaries consisting of Babcock Creek, Mankiller Branch and Adams Branch run through the length of this property. The property hosts an extensive road and trail system ideal for hiking and mountain biking. Of special interest are the large and open flood plains along the stream beds. Call (609) 625-8219 for directions and parking options. 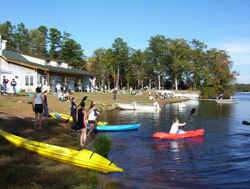 This park is located 3.5 miles south of Mays Landing on Route 50. It is bordered by the Great Egg Harbor River / South River to the east and by Route 50 to the west. In all, it is about 1700 acres large. 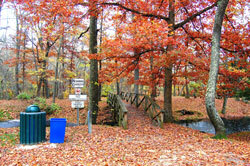 Estell Manor Park has many trails, athletic fields, picnic areas and is the location of the Warren E. Fox Nature Center. 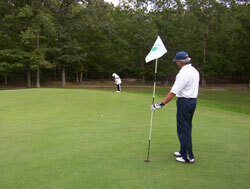 The Atlantic County Green Tree Golf Course was acquired by the county in 1992 using funding from the New Jersey Green Acres program. The course was part of a 193 acre tract obtained as part of Atlantic County's on-going efforts to preserve open space. This tract of land is located in the Galloway Township section of Atlantic County, and encompasses over 371 acres. It can be accessed through Highlands Ave., Seaview Ave., Jimmie Leeds Road, or Great Creek Road. Hiking and biking are allowed here. Hunting occurs here during the winter months, hunting (bow, shotgun, and muzzleloader). Located on Pomona Rd across from Richard Stockton University, this tract consists of 188 Acres, amenities include, Hiking, Biking, Bird watching, Hunting-(During Season). This beautiful park is located at the bulkhead of the Great Egg Harbor River in Mays Landing. It is easily accessible to the public, where one can enjoy picnicking, fishing (with a license), walking, or just sitting and watching. This park is an excellent opportunity for photography because of the spectacular landscaping done by park staff and volunteers. 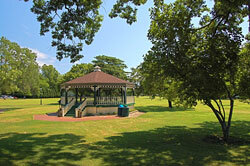 This park is also a very popular spot for weddings, which are usually held in the gazebo. For information about reservations at Gaskill contact Park Headquarters at (609) 625-8219. You may also moor your boat on the bulkhead, but you have to call the Park office at (609) 625-8219 for regulations and permit information. There is a playground and seasonal bathroom facilities here, and the Atlantic County Library in Mays Landing is just steps away. Gaskill Park was once a deep water port in Mays Landing during the Revolutionary War period. Four-masted schooners could pull into the port to load and unload supplies. Lake Lenape Park East and Lake Lenape Park West are located in Hamilton Township and together encompass over 2,000 acres of land. Each park offers a variety of activities and facilities for residents and visitors to enjoy with its own entrance and access points. Boating is allowed on the lake with proper permits as required. This is located in Galloway Township, and accessed through Leeds Point Road, off of Route 9 in Oceanville. It is a small parcel of land (slightly over 4 acres), but nevertheless is an extremely valuable natural area. Hiking and biking are allowed. Located on New Hampshire Avenue in Atlantic City. This park has been named in memory of Oscar E. McClinton, Jr. who was an Atlantic City resident who gave unselfishly of his time and talent to the community. 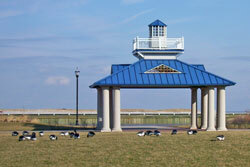 This park is located on 4 acres in the Northeast section of Atlantic City which emphasizes waterfront themes. It features a large open lawn area surrounded by a colonnade and decorative paved walkways. A central pavilion provides scenic views of the Absecon Inlet and functions as a protected sitting area. This park also includes a children's play area and a Boardwalk promenade. This is a small parcel of land (about 20 acres) located at Spur 561 and Eighth Ave. (right off of Route 322) in Folsom. Generally Penny Pot Park is used as a starting point for canoe trips along the Great Egg Harbor River (non-tidal section). From this starting point, you can go all the way down to Lake Lenape, stopping at Weymouth Furnace, Camp Acagisca and then Lake Lenape. The Park System does not rent canoes but there are other campgrounds that rent and transport for a fee. This tract of over 400 acres has an extensive internal trail system. Horseback riding options abound as well as hiking and Mountain bike riding trails. Access is gained along Park frontage on Pine Avenue. This tract of land is located in Egg Harbor Township, along the eastern shore of the Great Egg Harbor River. Riverbend properties consist of 1294 acres, and can be accessed by Mays Landing - Somers Point Road, Betsey Scull Road, or Lida Avenue. Hiking and biking and horseback riding occur here. The Firearms Training Center is located within the Riverbend Tract. 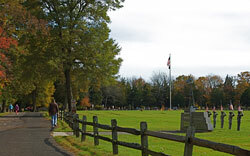 This park is located on Route 559 (Weymouth Road) just north of Route 322. It is about 11 acres. This was the original site of an iron furnace and paper mill in the 1800's, located right on the Great Egg Harbor River (non-tidal). Now it is a good site to load or unload your canoe or kayak, or a good picnic site. There are seasonal port-a-pot facilities. Take care not to damage the ruins that can still be seen. Whirlpool Island is a bay island located off the Northfield mainland, but is in the jurisdiction of Egg Harbor Township. It is located in Lakes Bay and only accessible by boat. The Atlantic County Office of Mosquito Control periodically visits Whirlpool Island and reports a viable nesting area. Not many people are aware of the island, because of its limited access. Located on the corner of Fire and Zion Roads in Bargaintown, Egg Harbor Township. This area is dedicated to those who served.